Valley High School in Elk Grove, CA, a California GEAR UP school, celebrated last night as 94% of their senior class (the GEAR UP cohort) walked across the stage and received their diplomas. The atmosphere in the room was electric, as the seniors, their families, and school staff enjoyed a near perfect graduation rate. The California GEAR UP-Valley High School model focuses on a cohort of low-income students who began in Grade 7 at Jackman Middle School in 2005-2006 and who matriculated to Valley High School in 2007-2008. For 2009-10, services for the cohort of 11th graders expanded to include support for AVID classes, College Fairs, College and Career Technical school visits, College Awareness classes and Leadership Skills Initiative curriculum specific to the African-American male students in the cohort. With a continued focus on developing the college-going culture throughout the school community, GEAR UP has been able to reach the entire school, not just the students within the cohort. Valley is the Number 1 (non charter) in Similar Schools and demographics in California. Of 100 Similar Schools in California, Valley scored a perfect 10. They are the only non-charter to do so! Valley had the highest API score of any non-charter school and had the 8th highest API overall. The effects of GEAR UP at Valley could not be more clear. A recent survey of seniors at valley indicated more than 36% were planning to attend 4 year colleges, while 60% planned to attend two year schools. With 89% of students responding, the whopping 96% of seniors planning to continue their education after high school is powerful evidence that GEAR UP works. 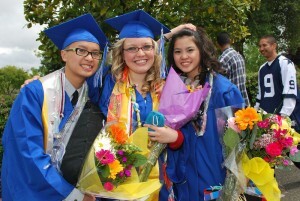 Share in the excitement by checking out the Valley High School Graduation photo album on our Facebook page.